What could be better than a front-row seat to century-old cypress, dazzling lakes and rolling hills? A view from the top, of course. 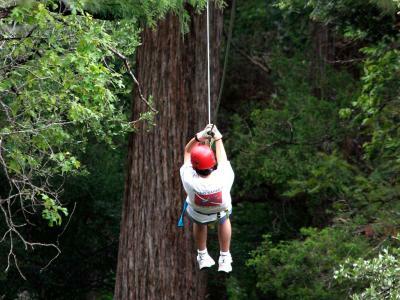 Soar like a bird through a patch of ancient cypress trees at Cypress Valley Canopy Tours in Spicewood. On a canopy tour, you can experience nature with an exhilarating ride that includes five zip lines, two sky bridges and a rappel. Their guided tours last up to two hours and give you a crash (metaphorically speaking) course in the local ecology. And when the sun goes down on your adventure, you can get some rest and relaxation in a magical treehouse nestled high above the ground in an old growth cypress. Take to the skies with a zip line adventure for the thrill of seeing Texas from above. For a zip line adventure with adrenaline-pumping aquatic vibes, head to Lake Travis to ride the longest, fastest zip line in Texas. At Lake Travis Zipline Adventures near Cedar Park, you’ll be zipping above a sparkling lake, rolling hills and incredible canyons. For a next-level thrill ride, make it a moonlit flight with a three-hour tour featuring glow sticks and headlamps. Their guided tours take place on five different zip line tracks ranging from 300 feet to over 2,800 feet. Then, for a more laid-back experience, zip over to Cedar Creek, where Zip Lost Pines offers dual lines for a side-by-side adventure through the loblolly pines of McKinney Roughs Nature Park. With the Zip and Sip package, you can kick back with a local beer or wine after your guided tour. To take your trip to even newer heights, stop by Natural Bridge Caverns, just outside of New Braunfels. Their way-above-ground adventure includes an exhilarating ropes course with four stories’ worth of obstacles, where you have 30 minutes to teeter, hop and grapple your way to the top. When you’re done scaling the 60-foot course, you can zip line high above the Hill Country while catching incredible views of the cavern’s sinkhole and its surrounding landscape. Many other popular zip lines are available throughout the state, including South Padre Island Adventure Park, Adrenaline Rush Zip Line Tour in Jacksonville, Helotes Hill Country Ziplines, New York Texas Zipline Adventures near Athens and Wimberley Zipline Adventures. Wherever you may roam, there are plenty of opportunities to see the beautiful landscape from a bird’s-eye view.